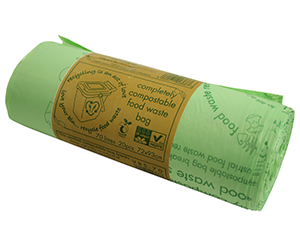 Certified compostable food waste bag. Breathable film keeps food waste cooler and drier, reducing odour. Proven barrier to bacteria, viruses, spores and mould. Transparent when wet. Reduces the need for bin washing. Mater-Bi material trusted by waste sector. Funky design. Lines bin, not for lifting.